This article will walk you through how payment processing works and how to set it up. What is payment processing and how do I use it? Payment processing automates payment transactions between you and the guest. It allows you to process, verify, and accept or decline credit card transactions on behalf of the merchant through secure Internet connections. There are many existing payment processors (also known as payment gateways) that connect directly to your bank account and transfer funds directly into it. In order to verify the legitimacy of your guests' credit cards and collect the payments immediately through Cloudbeds, you must be signed up with one of the payment processing companies we are currently integrated with. Click here for our full list. To use payment processing, first, navigate to your Payment Options page by clicking on the settings icon. Under the Credit Card tab, you should see a section to activate or deactivate payment processing. You will see a dropdown with a list of payment gateways underneath, along with authentication fields to the right of it. Select the payment gateway that you want to use. The required authentication fields are different for each payment gateway. This information can be found within the account setting of your gateway and by contacting your payment gateway's support team. If the credentials you inputted meet the required fields it will say "gateway verified". This only means that the credentials met the required data fields, but you still need to test the gateway to ensure the connection is complete. After you enter the required information and the account is verified, you will see a list of radio buttons to select the default option for direct reservations (mybooking reservations). If you are using myallocator to connect to either Booking.com, CTrip, Agoda or Expedia, you will likewise see an option to select a default option for those channels as well. Selecting this option captures the credit card information for you to access later. It does not do anything to the credit card besides capture the information and store it. When this is selected, Cloudbeds sends the transaction to your processor for authorization. If approved, the transaction is placed in your Unsettled Transactions with a status of Authorized/Pending Capture. The authorization places the funds on hold with the guest's bank. When the transaction is captured, the funds transfer process will occur. This can be useful in situations where the reservation is booked for a later date. You can authorize the transaction to ensure the funds are available, then capture the transaction to obtain the funds upon arrival. Please note: in myfrontdesk maximum period of authorization is 7 days. Authorizations which are more than 7 days old are considered as an auto-voided and are not shown in details. With this transaction type, the process is completely automatic. The transaction is submitted to your processor for authorization and, if approved, is placed in your Unsettled Transactions with the status Captured Pending Settlement. The transaction will settle at your next batch. Would you like this action to be performed immediately after receiving the reservation, or postpone it until closer to the arrival date? It can be advantageous to include the credit card billing address for payment processing purposes. When possible, myfrontdesk will capture the billing address for your guest's credit cards. It only applies to direct bookings. If a channel/OTA sends credit card information to myfrontdesk, we will display the credit card data that they transmit to us. We cannot force or require a Channel/OTA to include the credit card billing address for your Channel/OTA reservations. If you want to inquire with your Channel/OTA about automatically including credit card billing addresses, please contact your Account Manager at the Channel/OTA to see if this is possible. If desired, you can leave all of the options unchecked, leaving the billing address as non-required. What's the meaning of 'Use Guest Details as Billing Details when information is not available'? If the payment gateway settings were configured to ask for some additional credit card details in mybookings, when an OTA reservation comes, the system will fill out the basic card data and the rest of the of information will be pulled from the guest details. If you do not have this option available please contact our support team and we will help you. When the customer is paying with a credit card, you can select which fields you want to display and which of those fields are mandatory. Only applied to your direct reservation (booking engine). Depending on the gateway you choose, the list of fields will be shorten down according to each gateway. 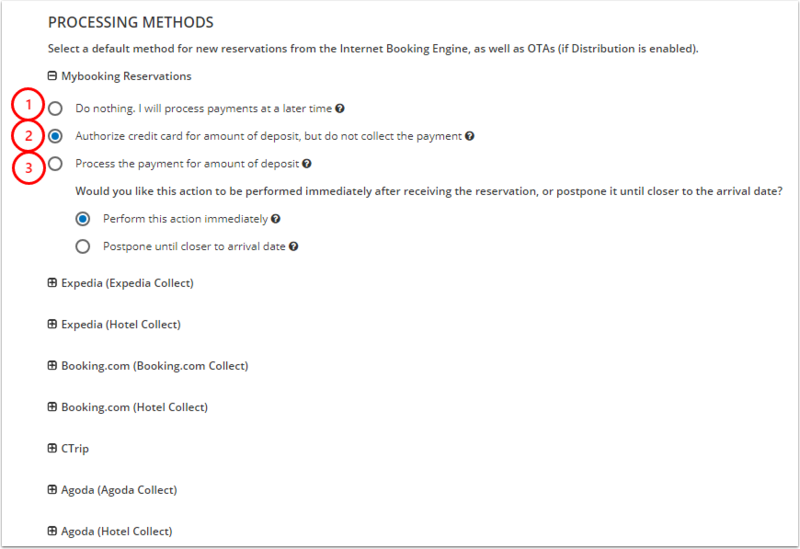 When creating a reservation, you can select what you would like to do for each reservation. You will be given all three options when creating a reservation directly. On reservation details page, click on "Credit Cards" tab. Enter all the card payment details. Authorize the credit card and enter the amount to authorize it for. Please note: in myfrontdesk maximum period of authorization is 7 days. Authorizations which are more than 7 days old are considered as a auto-voided and are not shown in details. Authorizing a credit card that already has an authorization will void the previous authorization, and create a new one for the new amount. Will capture the funds of the existing authorization. A field will appear to enter the amount, which can be less than or equal to the authorization amount. If a smaller amount is entered, the remainder of the amount will be voided. If a larger amount is entered, the transaction will fail. Will void the existing authorization and release the hold.